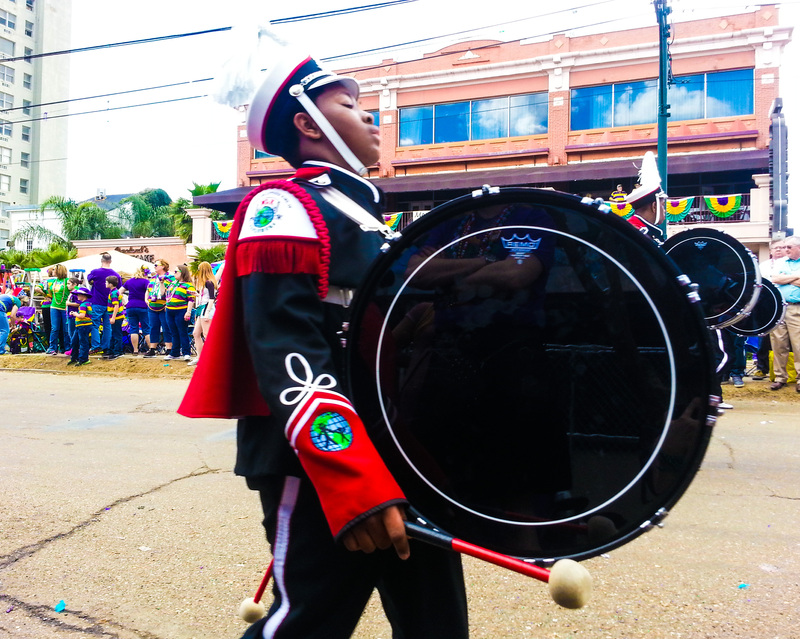 We Let Those Bon Temps Rouler! And good lawd did it wear us out! J and I live four blocks from St. Charles, so we leapt quite zealously into parade season, with the strong goal of Seeing Every Parade that Passes By For the Next Two Weeks. We almost made it. By d’Etat Friday, we had to take the night off. Bacchus Sunday, we took time off from the day parades to save our energy for that evening, and decided not to stay for Bacchus in its entirety because we still had Lundi and Mardi Gras to go. But, we almost did it! Next year, we can be more picky I think. At any rate, J and I are recovering from the Crud, aka Mardi Gras flu. Not the kind of Mardi Gras flu you incur all in one night, rendering yourself incapable of seeing straight the next day, but actual germy snot-filled crud. Okay, not actually flu either. But you get the picture. All those cold and rainy parades! They soak right into ya. But, we’re feeling better, slowly but surely, and life is good. This was a really exciting time. 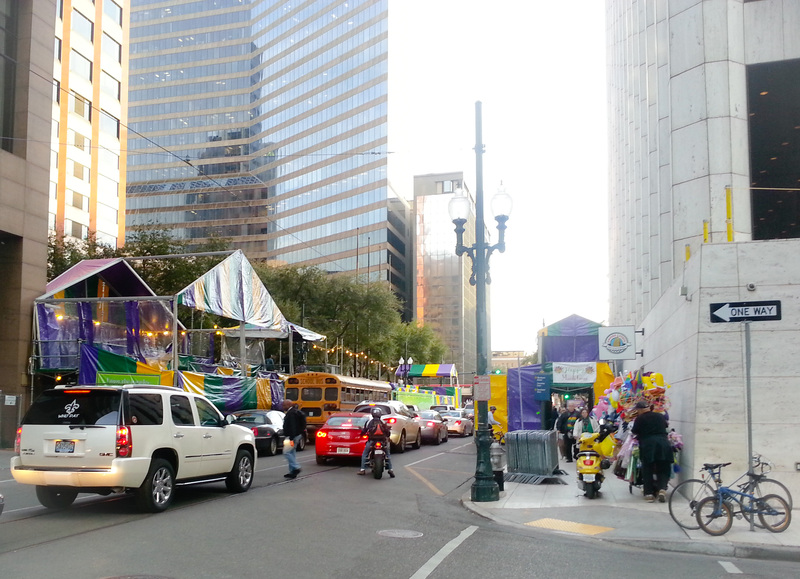 I remember last year, working in the CBD, feeling that Parade Day Vibe for the first time. It is epic, and something to behold! It’s in the air, it permeates everything. Everyone in good spirits, excitement, yeah! and it’s almost completely intangible in that you’re wandering off for lunch downtown during the work day and you can’t see anything in particular but just get hit in the face with the Energy. I walked home on the afternoons of every weekday parade, and it was pretty awesome, for the most part. All the parade stands were up, by 4:30 people were starting to gather on the street, from the CBD up to my place, and beyond. Staking their places, eating, drinking, playing football in da street. One big party. I quickly learned that if I needed to make good time getting home, avoiding St. Charles was the way to go. So my first parade hike home, I had to take St. C just to see it, and I did that a couple more times. Otherwise I hoofed Carondelet or Baronne until I got to Lee Circle. It’s the navigation around those stands. Tunnel after tunnel after tunnel, under or behind those things, almost Londonian in their back-alley girth. Not bad, except everyone else is squeezing through those things too, with their coolers and their baby carriages and their lazy hazy peaceful ambling paces. All great, except when you get off work at 4:30 for a 5:15 parade and have to go home and get changed and situated and get to your spot before someone else does, by golly one takes off with a deadline cadence! The stands disappear after Lee Circle, but the crowds are just as epic all the way up the Avenue. Lots of smiling and saying hi to strangers and even singing with them in some cases whilst passing by. Joking with the food and trinket sellers. Commiserating on the rainy days. It’s like the whole city becomes one big house. 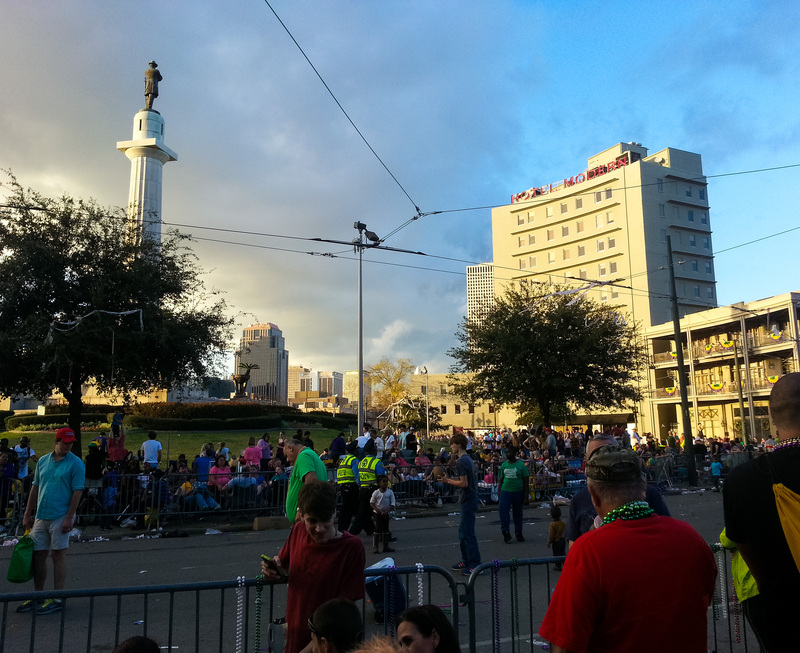 Our parade spot at St. Charles and St. Andrew became our second living room. There were times that I got to the LGD and couldn’t take the crowds anymore. That was around weekend #2, starting on Nyx Wednesday. So I’d cut up Melpomene or the like to Prytania and complete my journey from there. A block away, it got a lot more quiet and was a nice respite. And you never know what you’re going to see when you change your path. Like the corner of Prytania and Terpischore, where the bedecked namesake of that street stood mightily and with grace, hearkening to the bedlam one block away. It’s funny how the parades start to run together after a while. J and I were sorting the massive hoard of catches the other day and were amazed that we could place what we got from where. We kept things pretty organized, though, so it wasn’t too hard. One of many highlights this year was getting to know our neighbors. The Neighbors Above, and the Neighbors to the Right. The first night of parades, Oshun and Cleopatra, we all got to hang out together for the very first time. Fantastic, and so nice to finally connect! Excellent people, all, I’m glad we all live in such near proximity, and I’m looking forward to some fun backyard times this spring. A second highlight for me was J with Toys. Truly. This man can catch anything, and he took such glee with the fun stuff. Sparkly purple and gold pom-pom headbands. Alligator hats. Chaos devil horns. Aprons and colanders. He wore it all. Footballs. 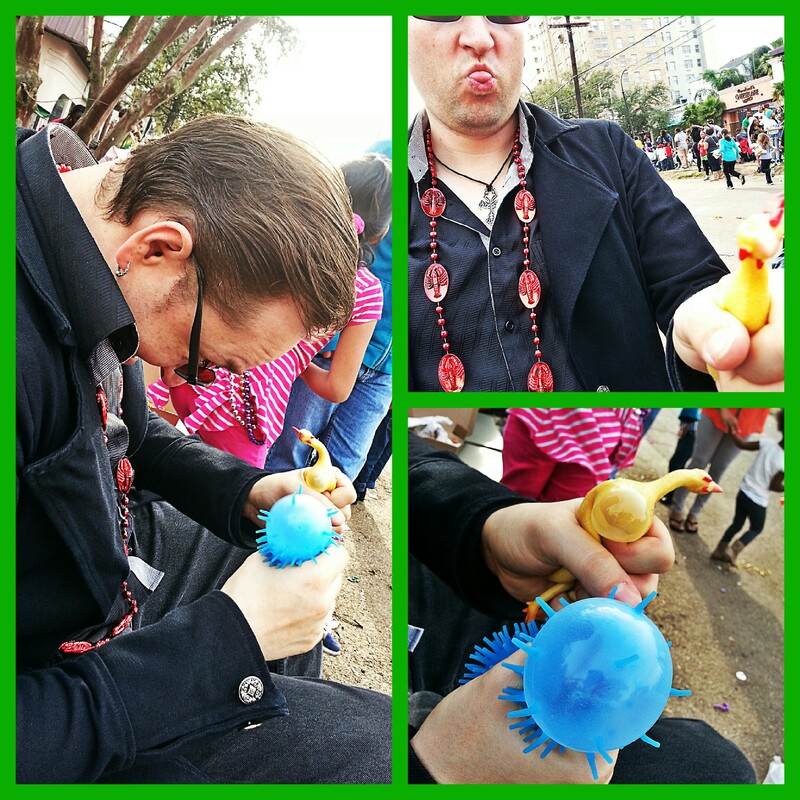 Rubber chickens. Weird squishy things. He played with all of those too. Although every parade experience was fun (despite some having more crowd issues than one would like), I have two separate days that stand out to me the most, where I had the absolute best time. 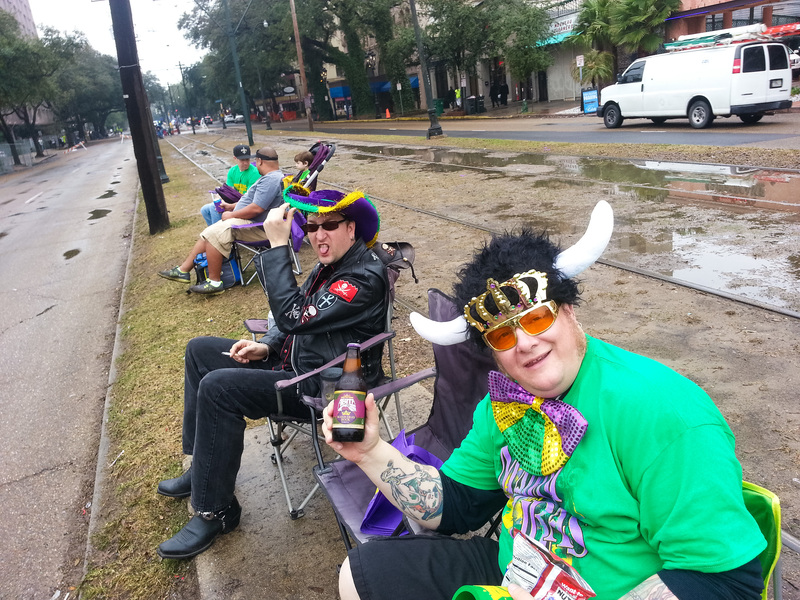 The first was the rainy, rainy Arthur/Carrollton/Alla parade, the first weekend. Our Irish buddy came up and spent the day. There was no one, hardly a soul, on the route that day due to the weather, so we nabbed a spot on the neutral ground for a change. I ran across the street and got a bunch of beer, and we got ourselves set up. J and I have had so many experiences camping in the rain that we didn’t really think twice about sitting out in it (probably the start of Mardi Gras flu right there), and it really was worth it. On the Loot front, you catch a lot of stuff when you’re one of the only folks out there. On the vibe front, there was a sense of solidarity between those of us who were weathering it together, and with the folks rolling and marching as well. You see some glum faces, and you also see some great spirit. One of the marching bands had a call/response as they walked by in their rain ponchos, instruments under plastic to keep them dry. “I’m soaking wet!” “I”M SOAKING WET!” on and on, up the street. Loved it. Spirit. And, of course, we got to see Pussyfooters that day. I hooted and hollered, I can tell ya!!! It was a good feeling to recognize some faces in that number! I went home that evening feeling Full of It. 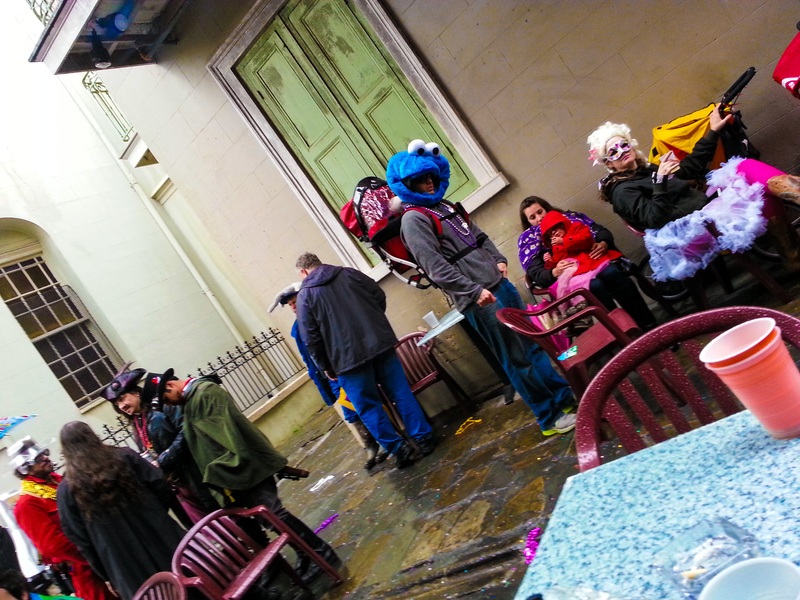 Just exuberant, despite being wet and bedraggled, hands dyed blue from rain-soaked beads. My other best parade experience was Nyx. HAIL NYX! This is the first time I’ve ever made a sign to get someone’s attention. I’ve been told to keep it, because it was easy to spot. See, Miss Bayoucreole herself rolled in Nyx for the first time!!!! She has been incredible and supportive for two years via our blogs, but we’d never met face to face. So I didn’t want her to miss me! I also discovered tutus. Oh yes, tutus. Or, in my case, petticoats, as I’m too shy to wear really short tutus. But it still counts. 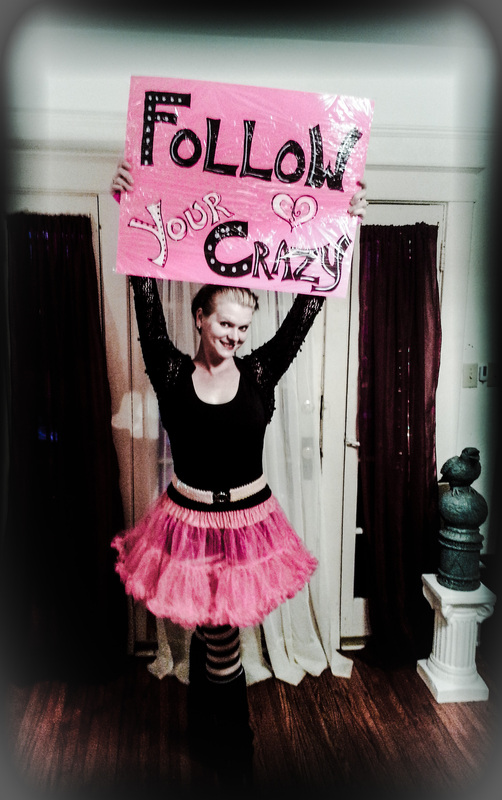 It had been rainy all day, so I hoofed home, changed, and covered my sign in saran wrap. The weather gloriously held, and the sign is unscathed. So I think I’ll have it laminated. 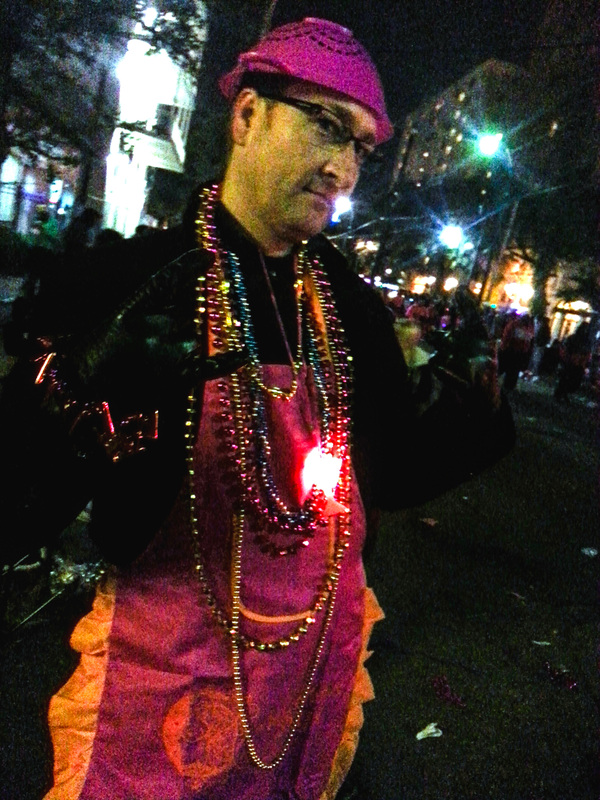 Nyx was a fun, fun, FUN parade. 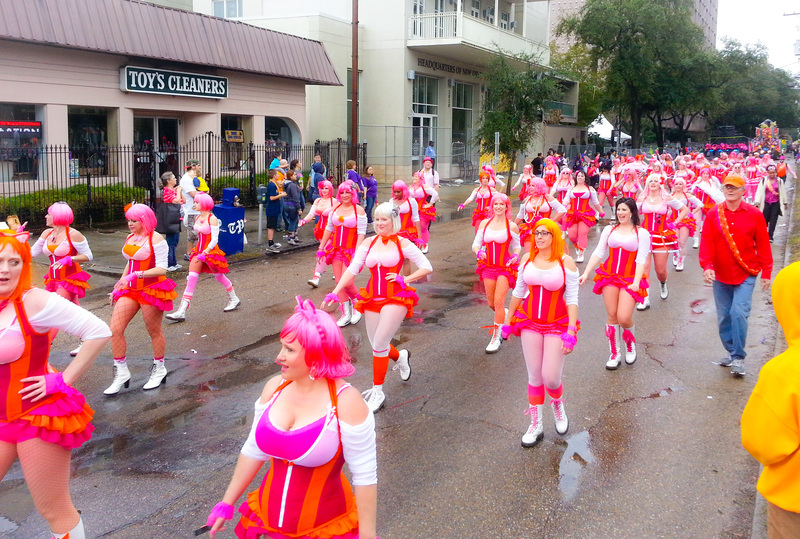 So much great energy coming from that krewe, you can feel it rolling off the floats as they roll down the Avenue. J was in high form. I told you he wore everything he caught! Aprons, colanders! Fashion! If everything he caught was an indication, he was the darling of St. Andrew that night. He even caught his own special Nyx purse! I eagerly counted floats, until Bayoucreole’s came. And then there she was! And what a way to meet! It was SO COOL to finally see her face to face, masks and all even. And then I was stunned and touched and moved when she handed down to me what I now call the Nyx Care Package which has all sorts of goodies and a most incredibly beautiful purse! Truly, I couldn’t believe it. It meant (and still means) so much. A true treasure. Later on, toward the end, I got to see another friend doing her first Nyx roll too! 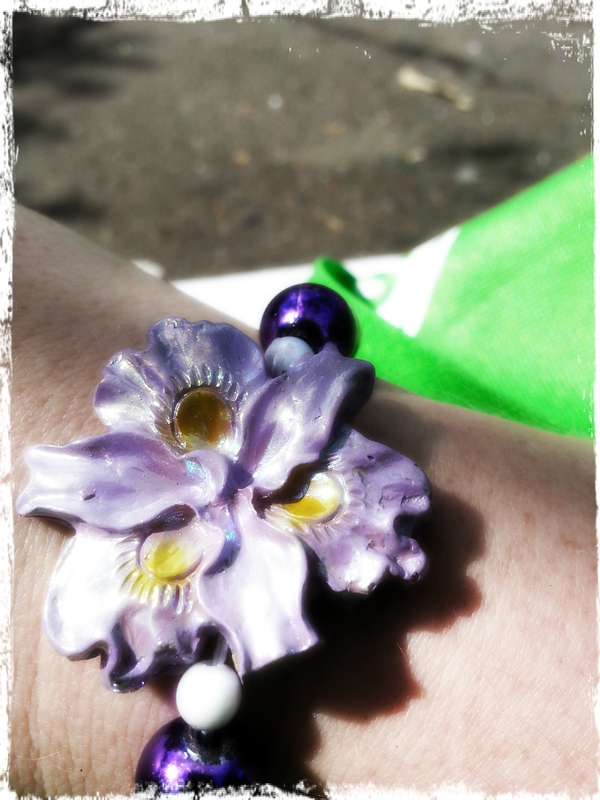 She’s the one I donated all of my pink and silver beads to, and she was equally as gloriously kind. As she rolled by, they were trucking along fast enough that, by the time she spotted me, she was already heading down the road! So there she was, leaning out over the edge, waving this purse at me. I quite literally jogged to catch up, through the throng, and got it. Nyx Workout!! Her purse is right in front of the image below. Nyx was hard to beat. As a matter of fact, it never was beat, the whole season! During weekend number 2, J and I were sitting on our sidewalk spot, and it was hot out. Well, it was warm anyway, and after the cold weekend prior, it at least felt hot. J and I were having this discussion about how we finally had figured out which Side we were. As in Sidewalk, vs. Neutral Ground. Definitely sidewalk folks, us. That’s the direction we come from, from the house, and it just feels right over there. SO, hot and enlightened, and in need of a lighter shirt, with plenty of time before the parades that day were going to reach us, J walked down the Avenue to the Fleurty Girl headquarters, and bought us shirts in honor of our at-last discovery. We’d been waiting to find out our Side before getting these! That was Iris and Tucks Saturday. It was pretty cool to see Iris roll, after going to their ball! Since we got to see everyone display their themes and costumes that night, it was great to see them all in action! 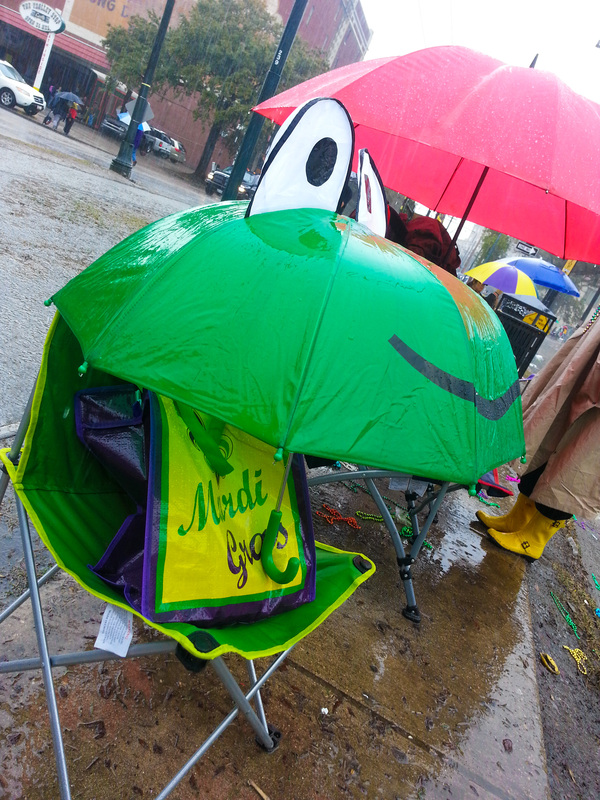 We didn’t see my Maid coworker as she was on the neutral ground side of her float, I think. But I did spot my boss’ wife, which was awesome! Tucks was a great time, too. We got two rolls of toilet paper!!! The City is working on this toilet paper ban for Tucks, since it streams everywhere and makes a worse mess than usual. Problem is, they were throwing it wrapped, so it was perfectly fine…but then you watch the people unfurl it and throw it around. You know. Anyway, if it’s the last year for Tucks Toilet Paper, we got two rolls and are all set. Last year, since we didn’t actually live in town, we caught the parades we did see from Canal St. Since then, I’ve come to appreciate the nice little nest of the Lower Garden District. More families and native folk, better groove. The closer to downtown and the French Quarter you get, the wonkier people become, and after spending the season up Here, being down There got very irritating, very quickly. But, Endymion, which we’d never seen, is a Mid City parade. So after Iris and Tucks, we walked down to Lee Circle, the closest part of their route to us, to see it. Absolutely gorgeous parade. And now I can say we’ve seen a parade from Lee Circle. And I can also say we will never ever EVER do it again! Met some cool folks while we were down there, but had to deal with some obnoxious drunk college kids too. On top of that, it’s like being smooshed into the tightest sardine can you ever did see. It’s just not worth the hassle. Next year, I think we’ll go to Mid City, have a different sort of day. 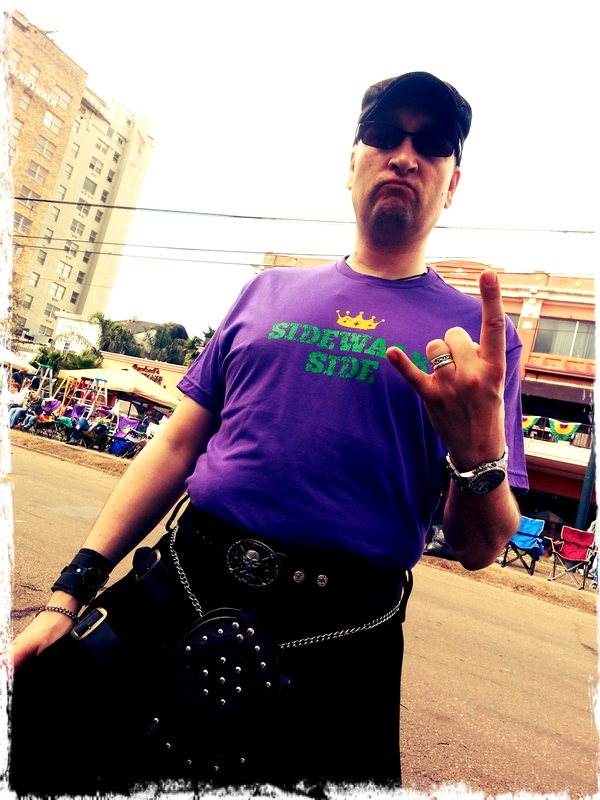 So, all of this celebration and eating and drinking and merry-making and parading culminated into Mardi Gras Day. …Except we had to go to J’s work, where they use that day as a client event, and J is the event guru. 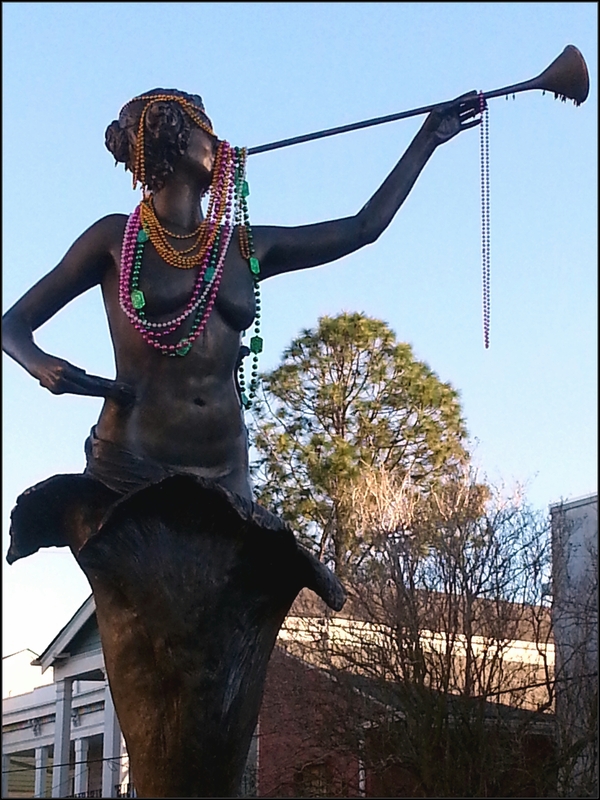 It was kind of sad, to leave New Orleans on Mardi Gras Day to head to Metairie. We ran into some Zulu floats on the way out of town, and I was grateful to get at least a glimpse. And I would miss my boss rolling in Rex. BUT, despite this issue and the terrible TERRIBLE weather, we made the best of it and had a good time. 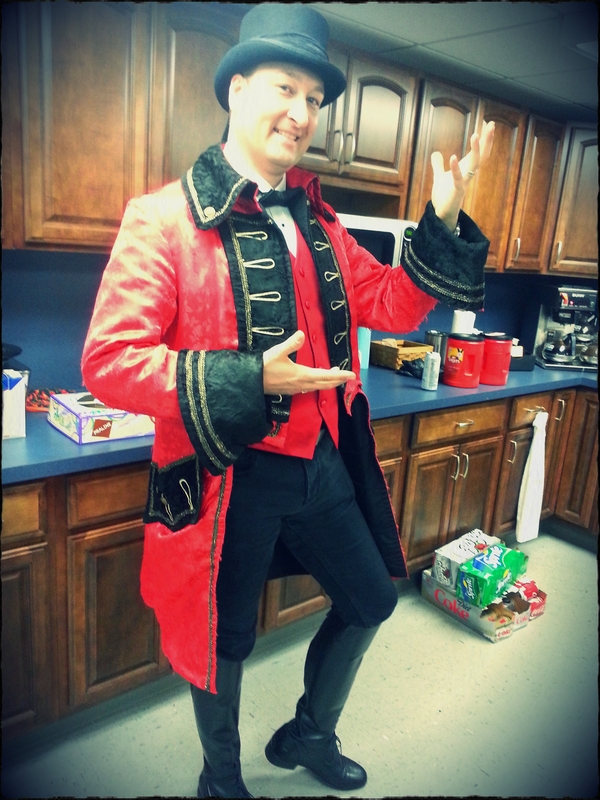 Since J was in charge, he dressed as a Ringmaster. 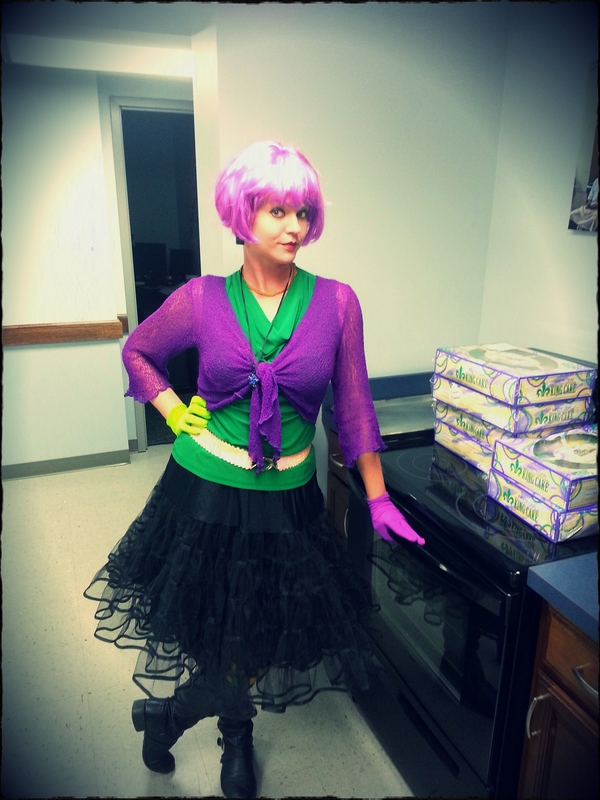 And since you can drag the NOLA girl kicking and screaming out of NOLA and into the suburbs on Mardi Gras, but CANNOT drag that NOLA out of the girl, I put on my very first wig and dressed up and did, as Infamaus called it, the Walking King Cake. This photo was the last time anyone saw what I was wearing though. It was so cold and so rainy that I was bundled up the entire day. I always have a good time with J’s coworkers, regardless of the situation. 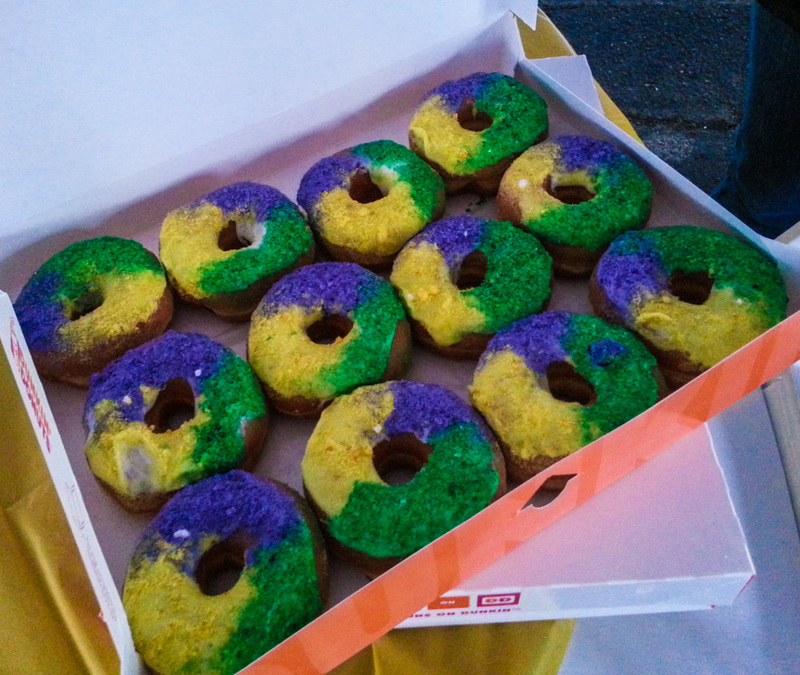 H brought King Cake donuts, much to my delight. And we all helped set up, and some of us kept dancing and eating and drinking even though the rain was flooding the pavilion tent. I had my first exposure to truck parades. Fascinating. Truck after truck after truck, throwing Stuff at you. Mainly geared toward the kids, lots of stuffed animals and toys. But I learned you can get ahold of some really cool old stuff. I caught a 1977 Atlas medallion bead strand. And something from Selene, from the days of yore. I also caught a pair of light-up Easter Bunny ears, which will come in handy when we spend our traditional Easter day in the French Quarter. It’s like the guy took one look at the purple hair and just knew. Anyway, cold and wet but it was fun hanging out with H and A and their kids. Unfortunately, the weather killed the event, after all the work and money that went into it. It was so cruddy, hardly anyone came. The boss made the call to shut it down. 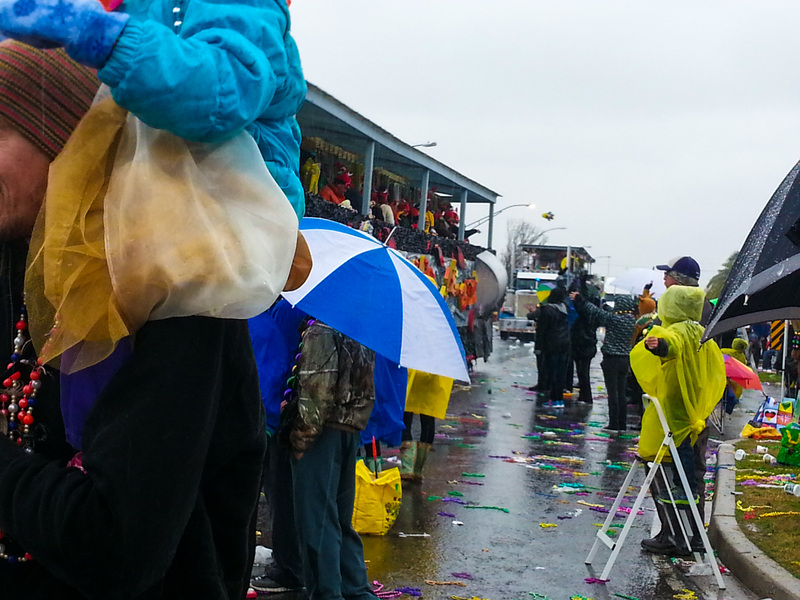 We were torn down, packed up, and ready to go by 3:00 p.m.
…which meant we could salvage some NOLA Mardi Gras! 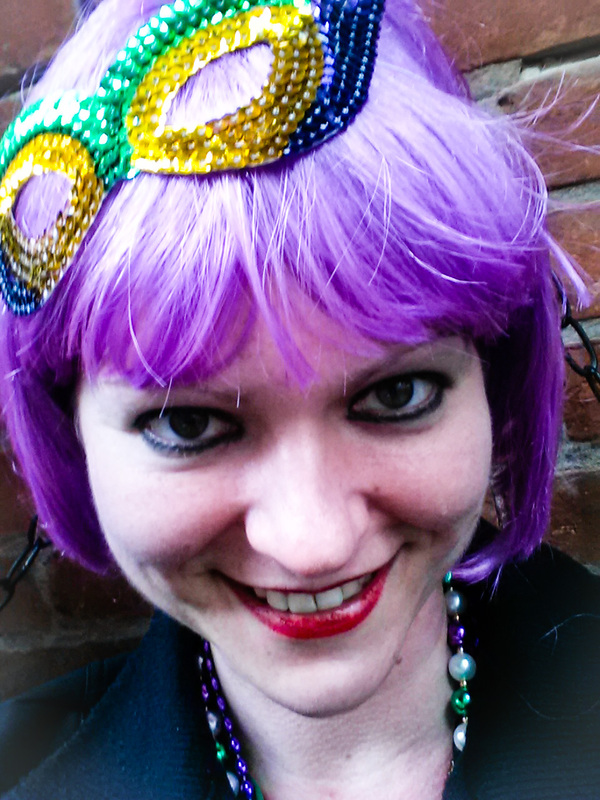 I needed just a little Weird in my Mardi Gras Day. So J and I and H and A went to the Quarter for a little while. The weather put a damper on the activity down there, too, but it was just nice to be there, we got to see some folks we know, and I still got some of my Weird. We were home warming up and drying our feet out by 6:30, in time to decompress for work the next day. Whereupon I woke up with the Crud, which is why it took so long to get around to writing this. So, some lessons learned: Don’t try to go to every single parade or you’ll burn yourself out; If possible, take the Thursday and Friday before Mardi Gras off so you can do some daytime things like the Greasing of the Poles which I didn’t get to see this year because it happens at 10:30 on Friday morning; Or get Lundi Gras off so you can see Rex meet Zulu and hear some good music; Always bring chairs to the route because parades get epic lulls; Don’t do Lee Circle – if you have to be downtown, Canal St. at least has room to move. Ash Wednesday morning, as I was pitifully ambling to my streetcar stop to go to work, I happened to glance down into the street at the corner of St. Andrew and Prytania because there was this pile of parade catches spread out in the gutter. Frisbees and footballs and the like. Whatever. As I got closer, I realized there were two 2014 Zulu coconuts laying there with the rest of the rejected. Forgotten? Dropped? Left behind, for sure. I promptly picked them up, walked back home, and put them inside. 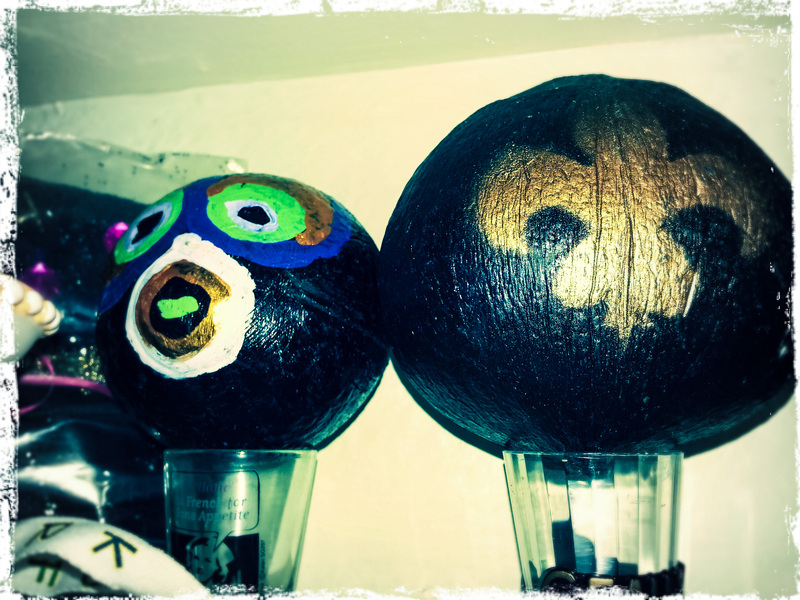 I may have missed Zulu on Mardi Gras day, but by golly, we got our coconuts. You just don’t leave these things behind. It’s sacrilege. Rescue Coconuts! Funnily, my coworker brought me some Rex throws as well, since he knew we couldn’t be there to catch stuff from the boss. So, we’re covered! 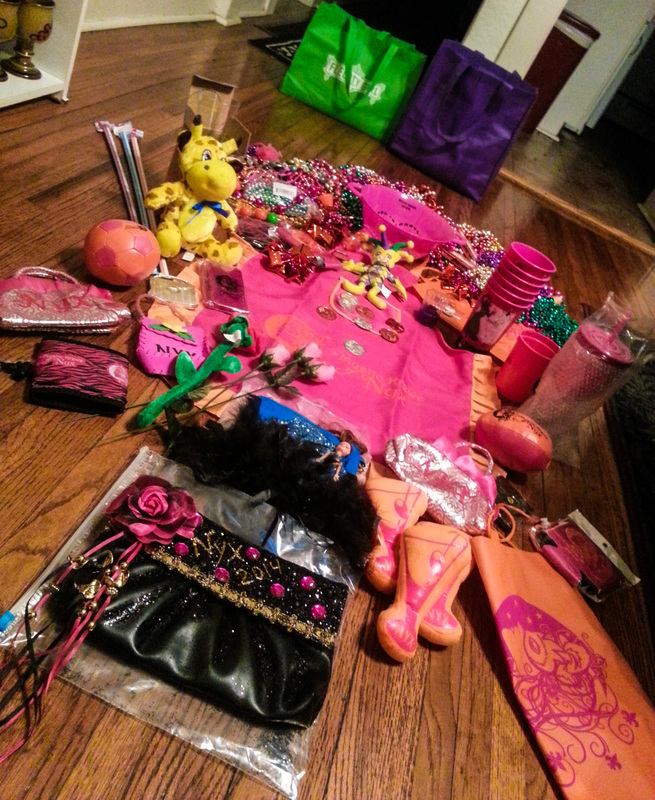 The massive piles of Stuff took over our living room floor on Saturday, as we spread it all out and got to sorting. It’s a good thing we have plans for most of it! 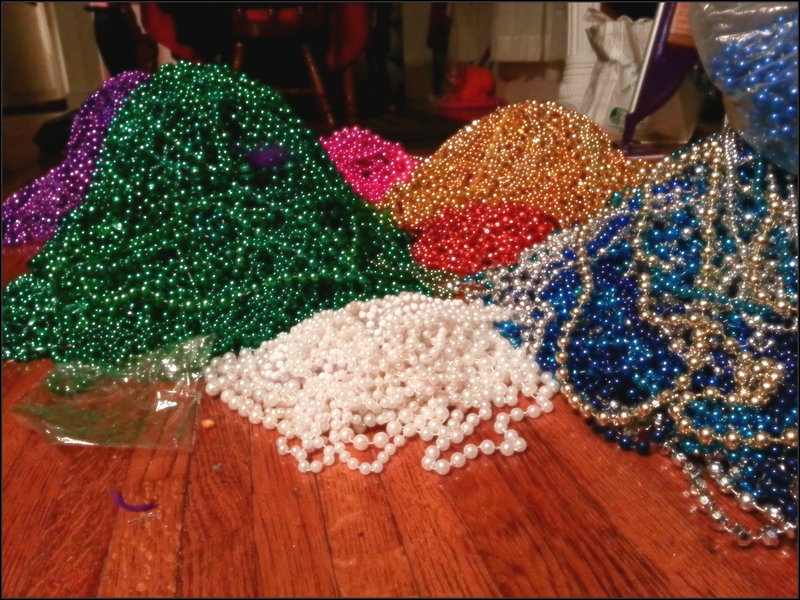 I could have rolled around in the bead pile like Smaug. So that, in a lengthy nutshell, is Mardi Gras 2014. Time to roll forward into St. Patrick’s Day – so, not much time to go into parade withdrawal, as that is happening this Saturday! We’ve already got the house decorated and everything. Never a dull moment, ’round here. I love your post! Y’all look so cute and J’s absolutely adorable in his nyx booty! I missed all of the parades except Nyx. That’s a first for me. …pretty sad about that but,I’ll make it up next year. It’s festival time! 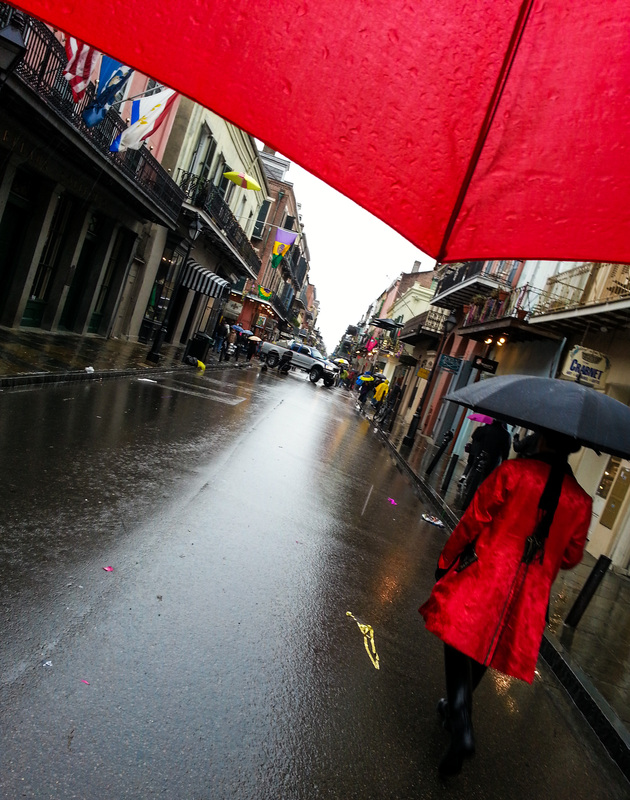 French Quarter Fest next month! Haha, thanks! It was fun watching him catch stuff and Wear It this year. 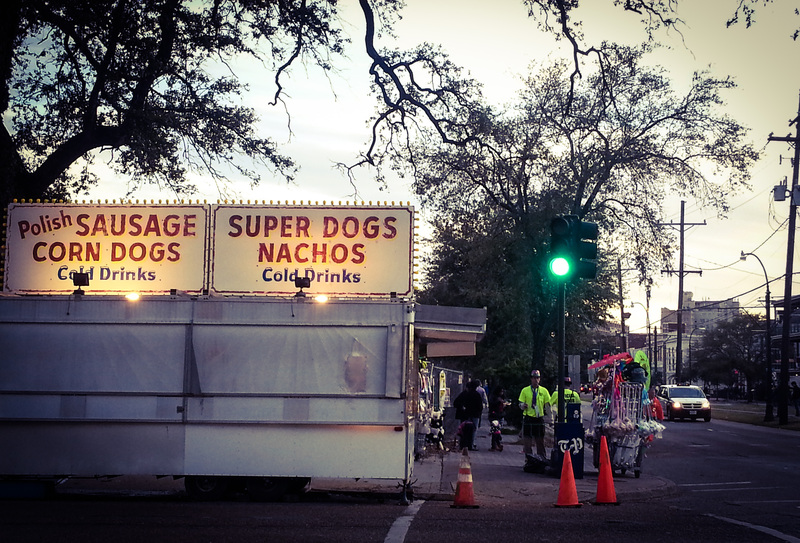 ;D Can definitely make up for lost parades next year! And I can’t believe festival season is upon us, yay! I should make Save the Coconuts campaign shirts, truly. Poor things! Your Nyx purse is beautiful and I can’t believe someone left Zulu coconuts. Insanity. Thank you! Was SO excited. 😀 And I know, true insanity indeed- they were like poor painted orphans, was more than happy to give them a home! I love that picture of you holding the sign! Thanks!!! I really wanted to do it outside with the neighborhood in the background but the early sunset and the rain were a deterrent. Since it survived the weather I’ll have to make it more permanent! 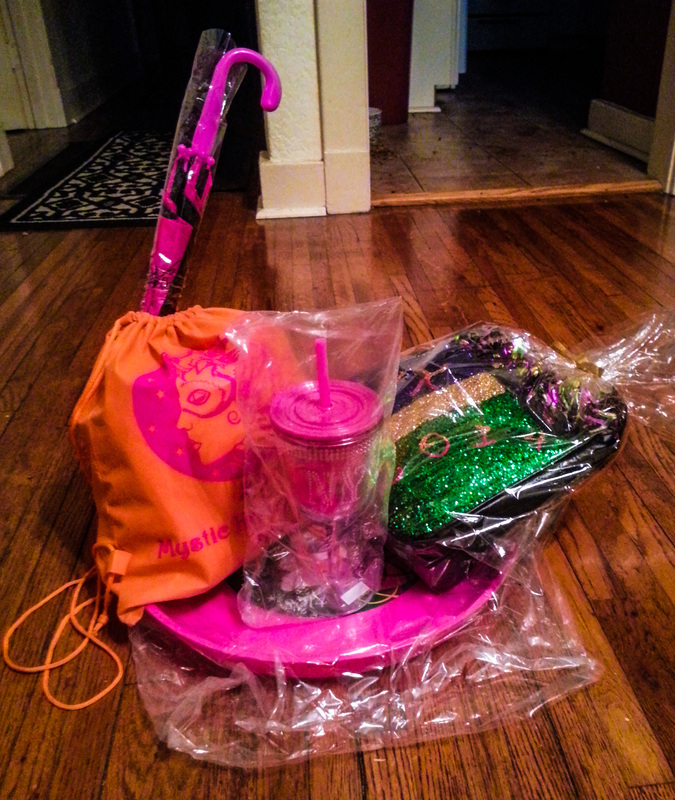 What a great blog to end your Mardi Gras season with. No wonder you and J are worn out and have the crud. �Ready to see some of the goodies when you all come up!